How often are minutes from a meeting recorded and sent out quickly after a sales meeting? Often times, no one receives the minutes until days later. The purpose of minutes is to highlight what was discussed along with who will be responsible for certain tasks after the meeting. Even though attendees take notes, the minutes usually contain even more details. To get the most from your meetings, minutes should be recorded immediately. Difficulties With Meeting Assistant for iPad Previous Versions – FIX AVAILABLE! While it would be great if you could anticipate every questions a client might have in a meeting, you never know when they might ask something that you don’t immediately know the answer to. What if you could improve client relationships by answering their questions quickly without ever leaving the meeting? 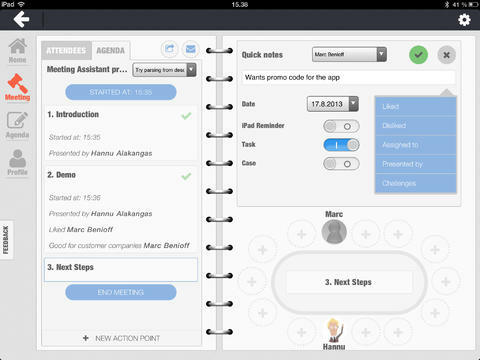 Meeting Assistant for iPad gives the power to seek out answers without leaving your client waiting and possibly considering the competition over you. Meeting Assistant for iPad Scoops Prize on Best Mobile Service in Finland 2013! The annual Best Mobile Service in Finland competition looks to highlight the hottest mobile innovations with global growth potential. Supported by the Finnish Ministry of Housing and Communications, the competition had a distinguished jury featuring members from major industry players, such as Microsoft, Nokia, IBM, Google and Samsung. Meeting Assistant ran in the Utility & productivity service for companies category and took home the first prize! It gives me great pleasure to announce that we have finally released Meeting Assistant® for Salesforce – your all-in-one productivity solution for business and sales meetings, integrated with world’s #1 CRM provider Salesforce.com. Today, I want to share the story behind the product. Like all good things, everything started with a personal need and the desire to make things better. It all goes way back to the early days of Punos Mobile, our company, when the idea of the Meeting Assistant sales app was just a couple of concept sketches on the back of a meeting handout. Meeting Assistant Announces Cooperation with Dun & Bradstreet and Goes Global ! We are thrilled to bring you major news about Punos Mobile and Meeting Assistant, your favorite iPad app for boosting your efficiency in meetings. Read on to learn what the buzz is all about and get the updated app today! D&B (NYSE:DNB) is the world’s leading source of commercial information and insight on businesses, enabling companies to Decide with Confidence® for 172 years.